Wow! 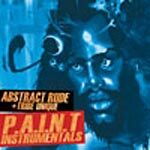 Finally there's an instrumental to the highly acclaimed and timeless album 'Paint'. Good thing too! These beats are fresh and soulful! All production by Fat Jack except: 3 by Kenny Seagal, 7 by Omid, 8&15 by Rob the Viking, 9 by J. Clark, M. Schreyer & J. Leimburg, 10 by Daddy Kev, 17 by DJ Artistic. 6. Dawning Of The A.G.E.